I don't do a lot of blogging on Hillary directly as Alegre really has that corner of the blog market sewn up (and not just Hillary - Alegre's Corner is a must read every day for political junkies. Give her the hits and throw her some change, 'kay?) and because my political blogging interests are more about the condition of political thought than about any specific politician, no matter how admired. I do, however, have a list of Hillary sites linked in the sidebar, with State Department links first. One link I have begun to click on routinely enough that I've added it to the streamed blog section (Just Click Already, OK?) is Madam Secretary, "an obsessive blog about all things Hillary Clinton. From her policies to her pantsuits, Madam Secretary delivers up-to-the-minute news, analysis, and gossip about America’s top diplomat." The blog is part of the Foreign Policy website. The Associated Press reports that Clinton has spoken on the phone with foreign ministers in a number of countries, and the Washington Post reports that she is asking them for a "strong, unified" response. 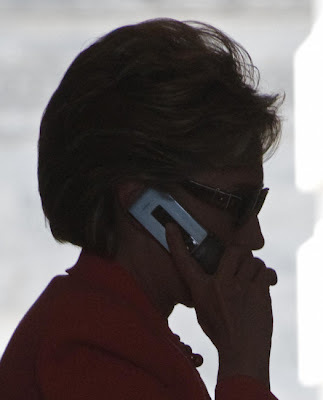 As Clinton proved last April, she knows how to handle those 3 a.m. phone calls. Zing. The SNL skit about The Precious calling Hillary at 3 AM on what he should do about this or that crisis has come true in more ways than one. Is the White House keeping Clinton off Sunday TV? Was Clinton too verbally hard on Pakistan? Is Hillary Clinton too outspoken? I keep thinking about the cartoon (no, I'm not giving it any eyeballs) drawn by Oliphant after the "tearing up" incident during the New Hampshire campaign where he portrayed her as sitting at a table and crying about how mean the foreign leaders on the other side of the table were being to her. And now the Village is having vapors over how pushy she's being. Which leads to an older post by Pat Lang which I did not blog about at the time, Jim Jones, Sally Quinn and the neocons, where he discusses a WaPo Op-Ed written by Sally Quinn about the whisper campaign being conducted against NSA Jim Jones by unnamed people in the State Department and the White House. Quinn tossed in this statement, "Reporters are protecting their sources, but Hillary Clinton is apparently not behind the stories. She likes her job, those who have been spun say, and gets along well with Jones. " Lang himself didn't pick up on Quinn's CDS, being more concerned about the neocon attack on Jones, but it jumped off the page at me. Quinn, who just cannot shake her anti-Clinton psychosis, introduces what was never a question in the first place, a division between Jones and Clinton. This is another example of a Villager trying to create a conflict by innuendo - the "apparently" qualifier is the dead give away. The second sentence diminishes the professional, diplomatic and policy authority of the Sec. of State. HRC "likes her job," as though this is a mid level manager at some tech firm in a Silicon Valley office park who is denying stirring up trouble for Bob, the project manager down the hall, because they "get along well." Quinn is too smart not to know that she's trying to solicit information from "those who have been spun" to give her a call and dish some dirt. So, the Sec. Treas. position went to a hack, but the other players in the foreign policy team, Gates, Jones and Panetta, all work well with Hillary. Sally Quinn's vengeance fantasies aside, there really does not appear to be any significant division or power struggle between the leaders of the agencies (which is not to say that there are not disagreements between the leaders, nor conflicts in the lower ranks), and that the US has a fundamentally unified foreign policy team. This is a good thing for the nation. However, this makes me ask a very serious question - just where is the resistence to deconstructing the Bush administration's terror regime originating? Obviously, the Republicans are frantically trying to keep the terms of the debate within a language game of fear and revenge, but the problem is larger than defunding Guantanamo. It has to do with the nature of executive power, the way the US's relationship to other nations and their citizens is conceptualized, the use of military and CIA power abroad to achieve domestic objectives, the constitutional constraints (and the ways in which such constraints are ignored) upon the exercise of power by the executive branch, the balance between competing claims of sovereignty, and so forth. As I pointed out obliquely in the Guantanamo post, when dealing with the use of the state monopoly on large scale violence, "them" and "us" is not such a clear distinction in our modes of political life. We cannot arbitrarily ascribe bad motives to only part of an administration without evaluating how the whole enables the part. Who is developing the theory of state and executive power for the Obama administration? Who is signing on to it? Who disagrees but executes? If the SOS, Sec. Def, NSA and head of the CIA are fundamentally in agreement, then does this mean they are the ones who have crafted this theory of power? I know where I want Hillary to be on these questions. We'll see if my hopes are borne out by facts. The Attorney General rates as one of the most powerful national security officials. Both the Secretary of Defense and the National Security Adviser have histories of poaching on State Department territory. The National Security Advisers were most powerful under Presidents Nixon, Carter and Bush 41. McGeorge Bundy always had the ear of the presidents he served but it is hard to rate his influence because the Best and the Brightest were all the same page for so long. Let's cut to the chase. Secretary Clinton would appear to be an important figure in President Obama's national security administration. Obama chose President Bush's Secretary of Defense as his own. The administration will be maintaining, if not increasing, the Pentagon budget; expanding the war in Afghanistan, and publicly institutionalizing the doctrine that national security officials are not subject to the laws of the United States. I am out of patience with all of them. By the time this is over I'm guessing Secretary Clinton's reputation will deserve about as much rehabilitation as does Secretary Powell's. Just don't count on Keith Olbermann to be there to give it to her. Some of the Gitmo/torture stuff may be in the hands of the WH political operatives rather than the policy wonks. The political operatives are worried about Obama's reelection, not foreign policy. As sitting Vice-Presidents both G. H. W. Bush and Al Gore had significant roles as national security officials. Bush's role grew as the Reagan administration progressed through the years. Bush and Gore were both presidential heirs-apparent during the second terms of the presidents they served. Vice-President Cheney was, throughout Bush 43's first term, the most powerful national security official ever to serve a president. Certainly Vice-President Joe Biden considers himself a leading expert on foreign affairs. According to his wife, he declined the opportunity to serve as Secretary of State in favor of serving as Vice-President. He is a life long champion of expanding the powers of the national security state and one can only assume that he is an influential member among President Obama's national security strategists. Sadly, I think it's Versailles as a whole that's doing this, and not only one person. My wake up call came when I read about the new Green Zone in Afghanistan, for the new US embassy -- which is only $20 million less than the Iraq embassy, the largest in the world (the one with the missiles on the roof and the Krispy Kreme donut shop). Well, State would have signed off on that. So, I can hope Hillary will play the long game and get us out of this mess, but that she would end the empire -- it's wrong, and we can't afford it -- was never the expectation I had for her. And if you want to prop up an increasingly creaky empire with lots of hard power and a lot less soft power, you need executive to do that, as Hadrian and that crew knew. I know where I want Hillary to be on these questions. We'll see if my hopes are borne out by facts.I agree with the spirit of the last paragraph of the post, above. The inner workings of the Obama administration are either well hidden or it's premature to understand and be familiar with. The current attempts to inform us about the inside relationships and the decision makers remind me of tea leaf reading of the Kremlinological sort. One clear element is Obama repulsion of any change except talking about it. His reluctance to deviate too from Bush's policies is an obvious and socking at the same time. I'm beginning to think that the political establishment in both parties is unwilling to back away from this because doing that would amount to a tacit confession that they participated in war crimes, cheered them on, or sat by weakly while they happened. I'd like to think that some Dems aren't part of that group, but I'm not holding my breath.